Sam Middleton ( New York City, USA 1927-Netherlands 2015) is painter, aquarellist and lithographer and is specialized in collages. 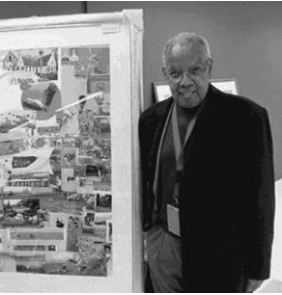 After growing up in Harlem and after having lived in many countries, (Mexico, Japan, Spain and Sweden) the “Master of Collage” settled down in the Netherlands in 1961. He lived in Amsterdam for many years but, fascinated by the landscape, settled in Schagen in Noord-Holland. Music, (both classical and jazz) and the landscape of North Holland, create the climate of his abstract expressionist work. Middleton taught at Atelier 63 in Haarlem and the Royal Academy of Art in ‘s Hertogenbosch. He passed away in July 2015.